I remember being young and trying out my grandmother’s exercise bike in the basement of their house in the woods. I didn’t understand the purpose of it then – after all, why would someone want to ride a bike which doesn’t go anywhere, especially when there were gorgeous trails nearby begging for a traveler to go to the blueberry hills? But as I have grown older and find it harder to exercise because of work and the weather, I can see the benefits. Exercise bikes like the Schwinn 130 and Schwinn 170 are a great way for the average athlete to squeeze a workout into any schedule without worrying about the weather, what time of day or night it is, or fearing for the stress done to their joints from running. But what makes a good exercise bike? What features should an athlete look for? And which Schwinn model is best? 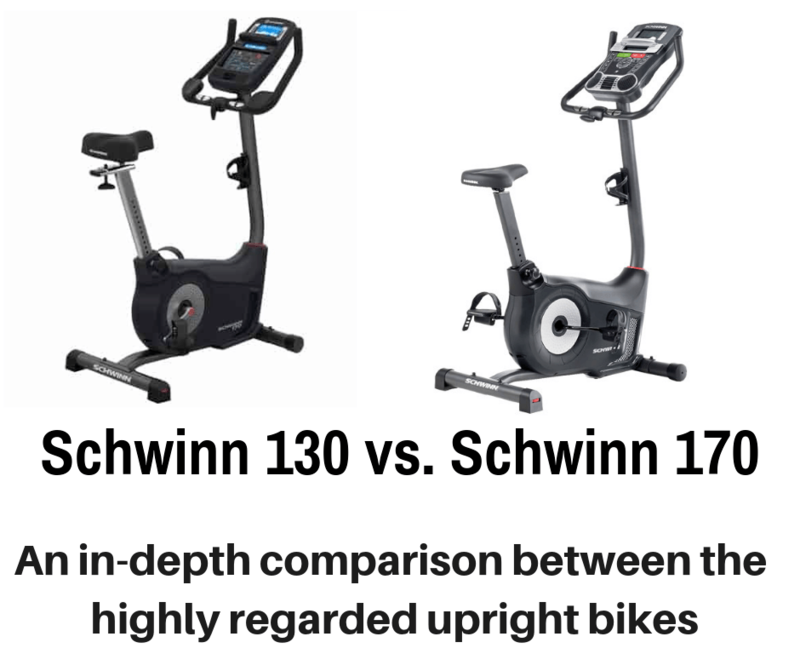 These are questions that this review of the Schwinn 130 vs 170 seeks to answer. The professionals at Spine Health note that there are two important varieties of exercise bike: upright and recumbent. 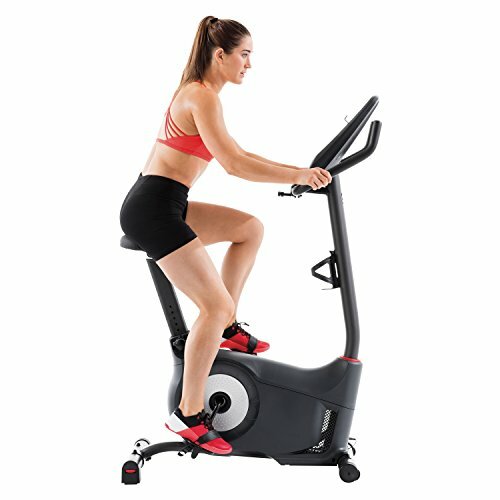 Most people know what an upright bike looks like – it’s one where the seat is just below the handlebars and the rider must sit straight with their arms angled down in front of them. Upright bikes are the most commonly sold type in the United States. An upright bike provides a more consistent workout than a recumbent version because the user will be in the same position each time. They are responsible for supporting their own body and need to balance on a small seat compared to the wider versions found on recumbent models. When sitting correctly, according to Lifespan Fitness, the user will need to be slightly hunched. 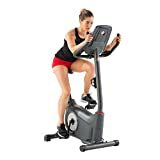 An upright bike also encourages the rider to use more muscles, such as the abdominals, and the shoulders. This can provide a fuller, more diverse workout than a recumbent bike. However, recumbents are more comfortable and less likely to cause spinal stress since the rider can recline and reach up for the handlebars instead of the other way around. Recumbent bikes have grown in popularity but still won’t be seen much on the streets. However, they do form a good portion of the exercise bikes sold around the world. This style mainly targets the legs and some parts of the arms, but will not cause joint or muscular damage just from sitting like an upright bike can. The Schwinn 130 and the Schwinn 170 are both upright bikes, so this article will focus on the benefits derived from this style. These items should seem like simple logic, but a lot of people complicate the process of buying exercise equipment. It’s important for individuals to purchase a bike which is comfortable for them to sit on and spend time with. This means that someone who is tall might require a larger exercise bike while a shorter person might need something more compact. People should also check resistance and whether they are comfortable sitting in the seat. Some bikes will be able to provide a harder workout than others, while some are meant for novice athletes. Seats also change by make and model, so a person should know whether they would prefer one that is large, small, wide, or narrow. 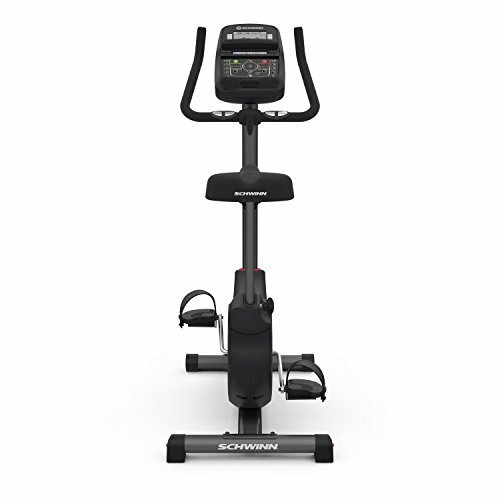 The Schwinn 130 is an upright exercise bike produced by Schwinn, a bicycle company in the United States. A standard version has two LCD monitors which show over 13 different elements of the user’s workout at any given time. Some of the information the bike reads includes distance travelled, current and average speed, calories burned, and heart rate. 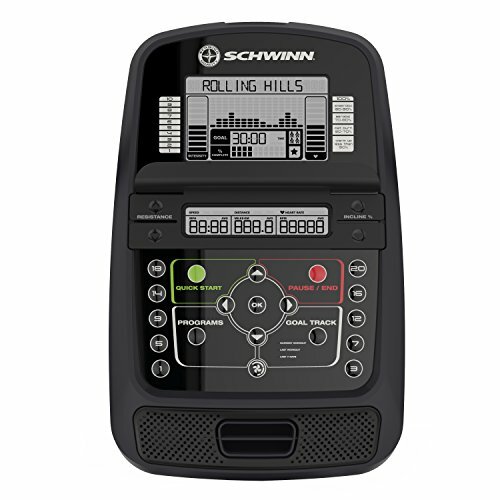 Similar to the Schwinn 230, It comes with 22 different workouts and has 20 levels of resistance for when people are pedaling. 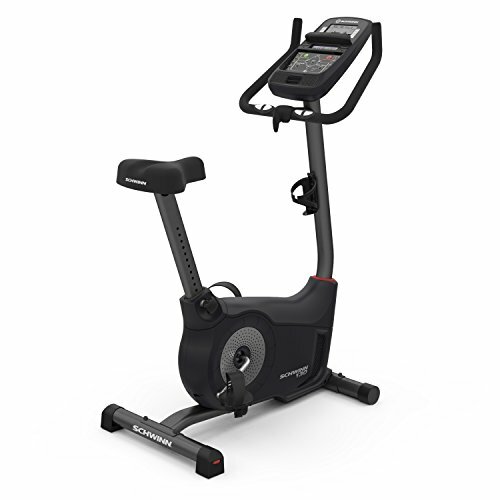 The Schwinn 130 includes wheels so people can easily move the equipment between rooms in their home or gym. A lot of individuals enjoy the Schwinn 130 because it has adjustable handlebars and a 3-speed fan to keep them cool while pedaling. It also comes with speakers so people can play their favorite music without needing headphones, and there is a weighted flywheel so that even really fast workouts don’t disrupt the smoothness of the pedaling. This bike supports people who weigh up to 300 lbs. and comes with multiple warranties. The one on the frame lasts for 10 years while there is a 2 year mechanical warranty and a 1 year electrical with all bikes. The pedals have toe straps for safety purposes. The Schwinn 170 is very similar to the 130 but includes many more features, making its price tag a little higher. 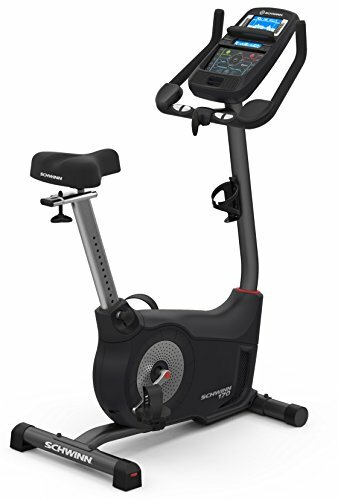 This upright bike features Bluetooth connectivity, two LCD displays, and over 29 different fitness programs for riders to experiment with and determine which works best for them. The display shows a lot of useful information related to the workout, including distance travelled, time ridden, calories burned, and heart rate. 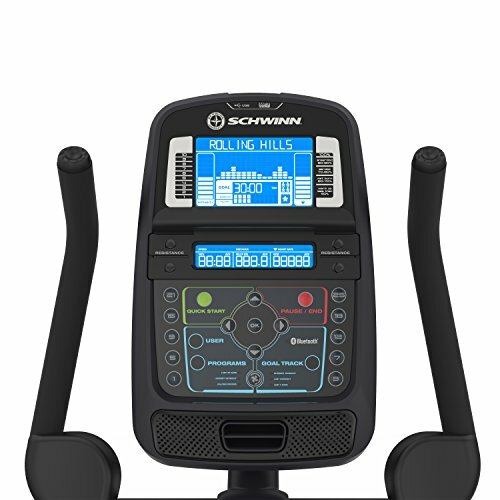 The Schwinn 170 can hold riders who weigh up to 300 lbs., includes a charging USB port, and can sync with people’s fitness apps to accurately transfer information. The seat is padded and can be adjusted to suit the rider, as can the handlebars. There are toe straps on the pedals for safety purposes and a weighted flywheel to keep the ride smooth. There are in-console speakers so the user can play their music and an adjustable 3-speed fan. Like the Schwinn 130, the Schwinn 170 comes with the following warranties: 10 years for the frame, 2 years for mechanical parts, and 1 year for the electrical mechanisms. Way better warranties than what Exerpeutic offers. Just based on the description of the bikes’ features, both exercise machines sound very similar, and they are. The real differences between the Schwinn 130 and the Schwinn 170 come down to how many programs are included, the comfort of the seat, and whether the bike will sync with newer technology. Because the 170 is one of the latest models, the manufacturers were able to include more workout options and levels of resistance for the writer. It also has Bluetooth connectivity and can sync with many different fitness apps to make the workout more enjoyable. However, it is much more expensive than the 130, even when adding the luxury of an adjustable seat. Out of both bikes, the 130 seems to have the most pleasant seat to sit on, but the bike might be hard for people who are extremely tall or short to use. This review recommends that athletes invest in the Schwinn 170, especially since it can for a relatively reasonable price. It has many more features for a little extra money but doesn’t sacrifice comfort to add a lot of technology. However, this will also come down to a person’s preferences. For the average person doing exercise, the 130 has everything they could possible need since most individuals do not use the maximum workout levels on exercise equipment. The important thing is for an individual to know their needs and make a decision accordingly. Both the Schwinn 130 and the Schwinn 170 would be great additions to anyone’s workout.